A $50 MILLION INVESTMENT WILL EXPAND OAKLAND’S SECOND-LARGEST MARINE TERMINAL: Other expected investments will separate railroad tracks from roadways build a refrigerated warehouse to increase chilled beef and pork exports. The ocean shipping industry that is becoming more competitive. Port of Oakland is teaming with private developers and public agencies to modernize infrastructure. Investments will create new logistics capabilities at the Port of Oakland. A Port of Oakland executive outlined a $600 million spending plan here today for growth at his West Coast trade gateway. Maritime Director John Driscoll told a maritime audience that Oakland would increase trade volume by investing in new facilities and better infrastructure. The objective: more containerized cargo. Driscoll said the port would team with private developers and public agencies to modernize the Port’s infrastructure. He said investment from all three sources would be used to create new logistics capabilities in Oakland. It will also help eliminate bottlenecks that inhibit cargo flow, he said. 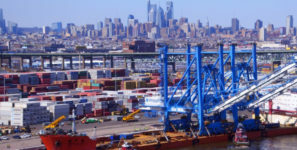 Among the proposed investments: $244 million, mostly from government grants, to separate railroad tracks from major port roadways; a $90 million, privately built refrigerated warehouse called Cool Port to increase chilled beef and pork exports; and a $50 million expansion, also privately financed, of the port’s second-largest marine terminal. Driscoll said the port has just completed a $100 million railyard near marine terminals and a proposed logistics complex. The proximity of the new developments should be a drawing card for shippers, he added. It will enable cargo to be quickly shifted between rail, road and ocean transport. That’s critical for time-sensitive international shipments. At most gateways, transferring of cargo – known as transloading – takes place away from the port.